Opened in 1916 as the Mikadow. Burned down in 1956. It was rebuilt and reopened January 19, 1957. It closed as a movie theater in 19?? and was operated as a church until it was purchased by Get Reel, Inc. and re-opened as a movie theater in May 2002. This is hands down my favorite movie house. Comfortable, unpretentious, great people running the joint, affordable prices. If they had a few special interest days ie. foreign film friday or a kung fu turkey fest, or an art flick or Independent film or two that would be great. But as is its a a good place to see a big budget hollywood flick! I frequently bring my granddaughters, age,8, 6 & 4 to this theater. I always call it "my favorite theater" and it is. Family friendly, unpretentious, reasonably priced. Not afraid to show Christian-based movies. So glad you're here. Staff is great. Food always good! The Marquee > Search > Owner/Operator > Get Reel, Inc. 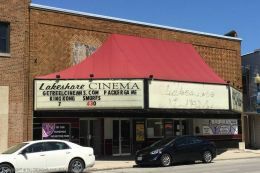 This movie theater is near Manitowoc, Two Rivers, Francis Creek, Whitelaw, Branch.